Taylor Swift is currently on her Reputation tour, which huge stadium stops planned all over North America. Do you want a full preview of the Taylor Swift setlist, maybe before you check her out live or in order to live vicariously through her music? Read our full breakdown below as we go through all of the songs Taylor plays on tour including special guests, show changes, and special notes on the Taylor Swift playlist! Check out Taylor Swift tour pictures, videos, and media from her show. After you check out the Taylor Swift setlist breakdown below, check out our full Taylor Swift tour guide for information on concert dates, VIP packages, and how you can get tickets to see Taylor live. 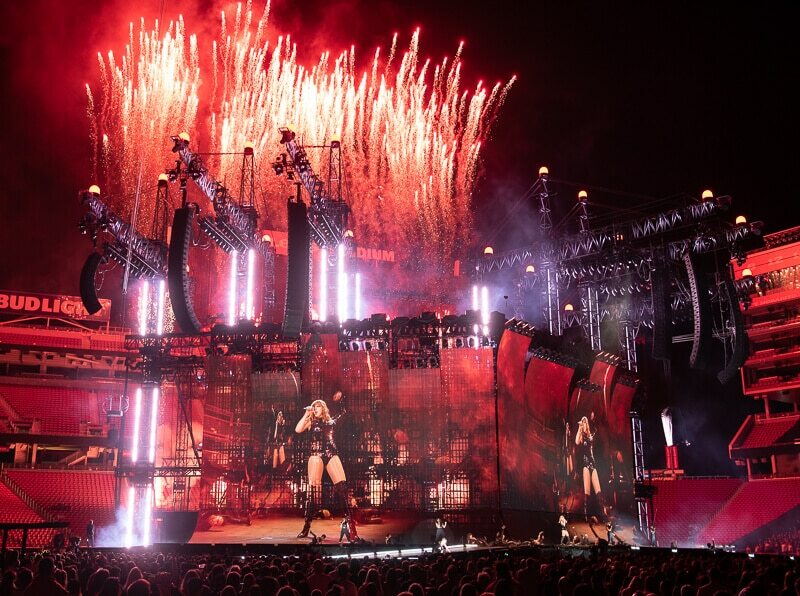 Before we get into the Taylor Swift setlist, check out this awesome shot of Taylor’s tour stage setup. A huge main stage with two big catwalks sits on one end of the tour. Complimenting them are two B-stages at either far end of each stage. We’ll tell you which songs Taylor Swift performs on each B-stage as well! Giant screen panels on the main stage move up, down, left, and right. Sometimes, they move to reveal Taylor’s band perched atop a large platform. Much of the artwork on the video panels have a snake theme, an alias that Taylor has taken full-on after being called a snake by Kim Kardashian on social media a few years ago. Mixed in with the snake theme are images of newspaper headlines, scrolls, and other breaking headlines that have followed Taylor Swift around with her over the past few years. Taylor Swift‘s tour is opened by performances by Camila Cabello and Charli XCX. UPDATE: Camila Cabello has now pulled out of tour dates after being diagnosed with exhaustion on May 22nd. After the openers are complete, the crew puts on the final touches and at approximately 8:45pm local time, the lights go dark. The Taylor Swift setlist intro is the opening track from her latest album, Reputation. It is perfectly adapted for the big stadium sound. Taylor owns the stage with her backup dancers, lights, fireworks and futuristic snake-themed display on all of the video boards. She wears a black bodysuit complete with hood. It’s her most mature sound and look yet and a good tease of how the entire show will be laid out. Sticking with her latest album, Taylor rattles through two more hits. Something Bad is a boom bap brag track about her flings, while Gorgeous brings her back down to earth. It is the fourth single released from her album and is an electro-pop radio hit. The next three songs are performed in a medley style. Love Story and Belong dip back into older Taylor Swift setlist packages and are just a short tease of the old Taylor. Taylor’s lead single off her Reputation album is placed in the front end of her tour setlist. Right before the song, a brief video interlude plays on the screen to introduce the song. Giant three story cobra snakes fill up the video boards behind a real cobra snake in the middle of the stage. Those people who didn’t enjoy it on the radio will be glad to hear that it sounds perfect in a live stadium venue. The snake effect and pictures are full-on here, reminiscent of her accompanied music video for the song. The infamous “Taylor can’t come to the phone right now” line is played out on the video boards courtesy of a Tiffany Haddish cameo that fans will enjoy. After the song, Taylor Swift talks to the crowd. She talks about the break between her last and current album and how she spent some time figuring herself out. During Delicate, Taylor Swift gets into a golden basket that lifts onto a wire and carries Taylor Swift through the crowd as she sings the song. Taylor lands onto a side stage where she performs the next song. Taylor Swift‘s tour openers join her in dancing to Shake It Off, from her last album. At the end of the song, confetti cannons explode into the crowd, hovering confetti into the air for a long time. After Charli and Camila leave the stage, Taylor is handed a guitar for a quick acoustic set on the side stage while her band gets a break. Dancing With Our Hands Tied is performed every night, followed by a random song of Taylor’s choosing. Some of the songs that have been selected so far in the tour include All Too Well, Wildest Dreams, and The Best Day. After her random song, Taylor dashes over to the second B-stage (pictured above) for some interaction with fans on that side of the stadium. Picking up energy again in the Taylor Swift setlist, she sings three favorites from her 1989 album. The small gap between Blank Space and Dress allows for a quick wardrobe change that doesn’t interfere with the show’s production at all. After that, she works in a small snippet of “Should’ve Said No” while a giant snake skeleton carries her back over to the main stage. For select shows on the tour, this is the spot where Taylor Swift brings out special guests to perform with her. Some of the guests on the first shows of the Taylor Swift Reputation tour were Shawn Mendes and Selena Gomez. Usually, they sing one or two of their songs with Taylor Swift playing hype women alongside them. Next, Taylor Swift jumps onto her piano for a two song performance. Between songs, she takes a breather to talk to the crowd and offer some of her perspective. This part of the Taylor Swift setlist really shows off how diverse her talent is. It is the last slow break of the show before the grand finale. By now, the Taylor Swift concert is in full party mode. During “Call It”, a ton of real news headlines involving Taylor Swift engulf the video screens. “We Are Never”, the lead single off her 2012 Red album is cut short and feels rushed in her playlist. During these three songs and the finale to come, there are more fireworks mixed into the show than before. The last song of the Taylor Swift setlist is not her most known, but is a perfect fit for her stadium show. Lyrics are simple enough that even the most casual of fan can scream along. The Taylor Swift Reputation tour truly feels like a live spectacle. Featuring dancing, acrobatics, lights, props, and costume changes, it feels like a mini Cirque show. Taylor has done a great job adopting the show for the big stadiums, so much that a smaller venue would not feel right. You can still find tickets to Taylor’s concert inside of our Taylor Swift tour guide today. This is going to be one of the top shows of 2018 and is well worth it no matter what your age is. If you are planning on attending the Taylor Swift show in 2018 or any other concert, book your hotel with our Booking.com widget listed below. You are guaranteed to get the lowest rates on a room around the world! Tour photos are credit to photographer Steve Carlson at Instagram.com/SteveCarlsonSF and Twitter.com/SteveCarlsonSF.